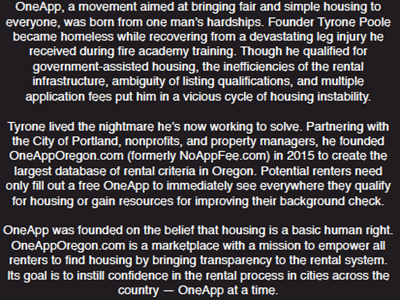 OneApp, a movement aimed at bringing fair and simple housing to everyone, was born from one man's hardships. Founder Tyrone Poole became homeless while recovering from a devastating leg injury he received during fire academy training. Though he qualified for government- assisted housing, the inefficiencies of the rental infrastructure, ambiguity of listing qualifications, and multiple application fees put him in a vicious cycle of housing instability. Tyrone lived the nightmare he is now working to solve. 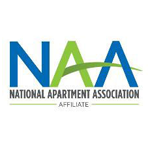 Partnering with the City of Portland in Oregon, nonprofits, and property managers, he founded OneAppOregon.com (formerly NoAppFee.com) in 2015 to create the largest database of rental criteria in Oregon. Potential renters need only fill out a free OneApp immediately to see everywhere they qualify for housing or gain resources for improving their background check. 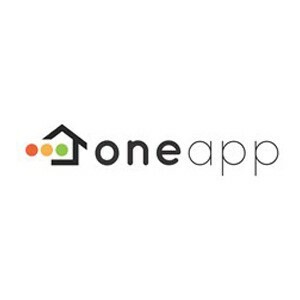 OneApp was founded on the belief that housing is a basic human right. OneApp is a marketplace with a mission to empower all renters to find housing by bringing transparency to the rental system. Its goal is to instill confidence in the rental process in cities across the country- OneApp at a time. We are excited to launch OneAppWashington in April 2018!